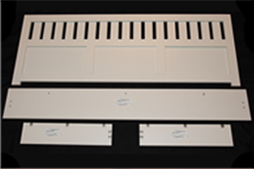 Our new Cabinet Kit, constructed of Melamine, provides an affordable solution to covering old, unsightly radiators. 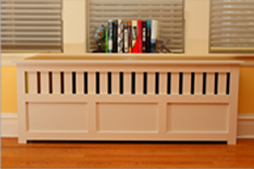 Its modern, clean lines will dress up any room while keeping children and pets safe from hot radiators. In addition to homeowners, landlords and renters will be pleased with this affordable option. Our kit comes in 4 colors: Oxford White (Bright White), Antique White (Creamy White), Wild Apple (Cherry Wood Grain) and Chocolate Apple (Walnut Wood Grain). The kit will arrive in 4 parts: (1) Front Grill (1) Top with Insulation (2) Side Panels. The assembly is easy. 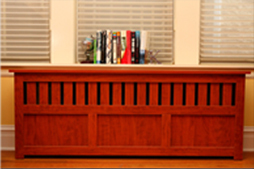 All of our cabinets will have a 1-inch back overhang unless you request it to be larger (to accommodate thicker baseboard/quarter-round molding, or you can eliminate the back overhang if there is nothing to clear). All you need is a Phillips screwdriver and hammer. The cabinets are finished, predrilled and ready to assemble. All hardware will be provided. Click HERE to view the PDF order form with pricing information. 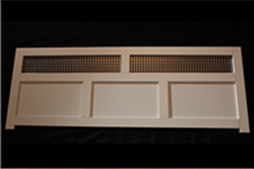 Click HERE to view a PDF of our finish options. Click HERE to view a PDF with detailed instructions if a side panel notch is necessary.